How I love to watch the birds feeding at this time of year. The addition of suet to the offerings has brought many. When I stroll through the garden at the side of the house they swoop upwards enmasse into the pines with a whisper of wings which quells the heart. Indeed the heart is as a little bird, sensitive and fluttering. Now for the fabulous news. I have become a member of ArtPoint Gallery & Studios, which is an artist run society, studios and gallery. Upon submission of my portfolio, I was juried in by the jury of other artists. I am looking forward to contributing to the society and connecting and being part of a network of artists which will really be empowering. This means I still have to work at marketing and promoting my own art, but I have a place to show it, which will give me more visibility. Being a member of ArtPoint will certainly help me take my art career to the next level. Their aim is to be a model for artist run cooperatives and I am thrilled to be a part of it all. 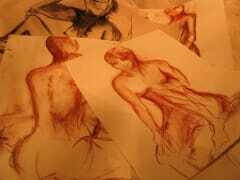 Monday night I attended the weekly Figure Drawing session at ArtPoint. Here are some bits and pieces resulting from drawing from a live model, one minute to twenty minutes sketches with charcoal and conte crayons. They are done fairly quickly and not necessarily complete. Wonderful practice while contributing to an inspiring head-space. May your head-space be awesome this week!